COLORADO SPRINGS, Colo. -- The Falcon 1 rocket was leaking fuel four minutes prior to liftoff,causing the first stage engine to catch fire about 25 seconds into its rocket'smuch shorter than expected maiden flight, dooming the rocket and its payload. Elon Musk, chairman and chief executive officer of ElSegundo, Calif.-based Space Exploration Technologies (SpaceX) said the cause ofthe leak was human error, not a design flaw. "All current analysis shows that the nature of the problemwas a pad processing error the day before the launch," Musk said during anApril 5 presentation at the National Space Symposium here. Musk said the mistake was made by "one of our mostexperienced pad technicians" but declined to provide further details on theerror, saying he did not want to get ahead of an ongoing launch failureinvestigation SpaceX is conducting with the Pentagon, its customer for themission. Sources familiar with the investigation said the padtechnician had been working on the rocket's avionics the night before launch andfailed to tighten a tiny fuel pipe fitting that had been loosened in order toperform the avionics work. In the final minutes before the March 24 liftoff, Falcon 1flight controllers saw no pressurization drop that would have been anindication of a problem onboard the vehicle. "If we had been looking at the right data stream at the righttime we would have caught it," Musk said. Instead, the rocket was launched. About 25 seconds into theflight, a fire broke out around the top of the main engine, damaging thefirst-stage helium pneumatic system used to pressurize the rocket's fuel tanks.Four seconds later, once the pressure dropped, the Falcon 1's Merlin engineshut down. The rocket subsequently crashed into a reef not onekilometer from SpaceX's Pacific Ocean island launch facility in the KwajaleinAtoll. 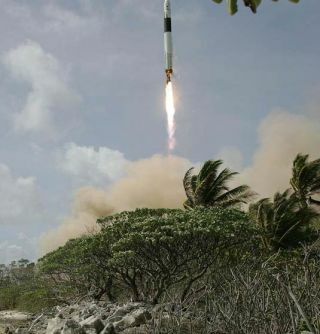 The rocket's payload, a small experimental satellite called FalconSat-2that was built by cadets at the U.S. Air Force Academy, crashed through theroof of an unoccupied storage shed on the island and landed next to theshipping container used to transport it to Kwajalein. Musk said he views the Falcon 1 launch as a "partialsuccess" because the primary objective of the mission was not to put the$700,000 satellite in orbit but to gain flight data on the rocket and show thatit could be made ready to launch in a couple hours or less. "We obviously cannot say it was a complete success. Thatwould be ludicrous. We also cannot say it was a complete failure. That would bejust as inaccurate," Musk said. The U.S. Air Force and the Defense Advanced ResearchProjects Agency paid $8 million for the mission in order to evaluate the Falcon1's suitability as highly responsive launcher. Musk said with additional work,a Falcon 1 could be prepared for launch in under an hour. Musk said none of his customers have given any indicationthat they intend to flee in light of the Falcon 1's unsuccessful debut, andmany have gone out of their way to show their continued support. Musk himself stressed that he is not discouraged and remainscommitted to the Falcon's success. "Both me personally -- and SpaceX -- are inthis for the long run. We're not going to cut and run if we have a few issues.We're not going to cut and run if we have a lot of issues. We're going to seethis through." During an April joint press conference here with Musk, LloydFeldman, the assistant director of the Pentagon's Office of ForceTransformation, said the office was not fazed by the Falcon 1's botched debutand still intends to launch the experimental TacSat-1 on the rocket's nextmission, which is expected to occur this fall from Kwajalein. "This is what taking risks tastes like," Feldman said. "There is no such thing as a smooth learning curve. You only learn by failure." Musk said SpaceX will make a number of process changes inlight of the launch failure, among them, a further automating of the Falcon 1'svehicle health monitoring system. He said SpaceX will increase "by an order ofmagnitude" the number of software aborts that can trigger a launch abort inresponse to abnormal sensor readings. None of the fixes SpaceX intends to make are expected tomaterially impact the cost, Musk said, adding that the company intends tocontinue to offer Falcon 1 launches for $6.7 million. Musk also announced during the symposium that SpaceX hadsigned up a new customer for the Falcon 9, the nine-engine Falcon 1 follow-onrocket the company still intends to introduce in 2007, albeit two to threemonths later because of the failure. Musk said MacDonald Dettwiler & Associates of Canada had purchased a Falcon 9 launch slated for 2008, noting that the deal was completedafter the Falcon 1's unsuccessful debut. MacDonald Dettwiller & Associates officials said thepayload for the Falcon 9 launch is Cassiope, a Canadian mission to demonstratean experimental store and forward data delivery system for transmitting largedata packages. The roughly 500 kilogram satellite also includes a scienceinstrument and will be launched into low-Earth orbit. Musk also visited the U.S. Air Force Academy here April 5where he offered to launch a future cadet-built satellite for free on a Falcon9 and to pay the travel expenses for four cadets to attempt. Musk, 34-year old technology entrepreneur, had his comingout before the traditional aerospace community in 2003 at the National SpaceSymposium as the featured speaker at a Colorado Space Business Roundtablelunch. He predicted that he would launch the Falcon 1 within 18 months.